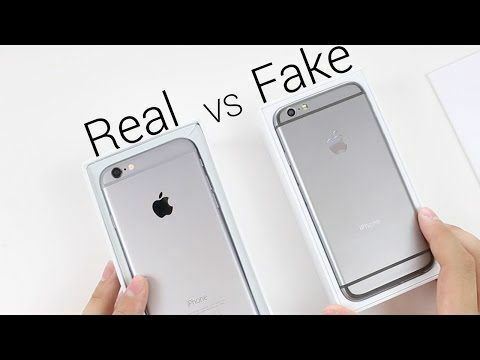 In many countries, counterfeiters are duping customers into buying fake and knock-off Apple handsets, so you should know what to look for when buying an official iPhone. Not only because of performance and quality, but also because fake Apple phones and chargers are linked with injuries or even death. This safety issue is especially common in Asia, where counterfeit Apple products are rife. Sometimes fake handsets are sold in authentic iPhone boxes, pictured. First at all, just look at the device – authentic handsets come with the “Designed by Apple in California” stamp. Always check that the iPhone you are looking at matches the correct size and specifications. Criminals use sophisticated techniques to dupe users, so the best solution would be to compare the iPhone somebody is selling you with a friend’s iPhone. The processor speed, touchscreen and feel should be identical. Keep in mind that all iPhone and iPads are sold with official Apple chargers. Make sure the phone has the Apple logo on the back of the phone. The logo must be almost flush with the back. The logo should also be less reflective and darker than a mirror. If the logo has a mirror finish, it is probably fake. Check to make sure the serial number on the box matches one on Apple’s official support site. Official handsets will come with a serial number printed on the rear of the device. So, this serial number can be entered into Apple’s Service and Support Checker to confirm a device’s authenticity. Be sure to look at the top of the box that the phone comes in. The authentic iPhones do not have a phone pic on top. Instead, it features an embossed phone outlined, which should be distinct and of good quality. Another thing to look for in the box is the specs on the bottom of the box. The real box has a list of specifications. Keep in mind however, that an official box is not necessarily an indication of an official phone, as boxes can be recycled! The best way to confirm would be an on-line live connection between phone and an Apple authentication server – anything visual printed on the device can be copied. The best advice we can give you, is to simply buy from known source. Avoid buying from a stranger on a street, since it’s a high chance you will end up with a cheap Chinese knockoff. iGotOffer.com: the best place to sell used iPhone online. Free quote and free shipping. BBB A+ rated business.